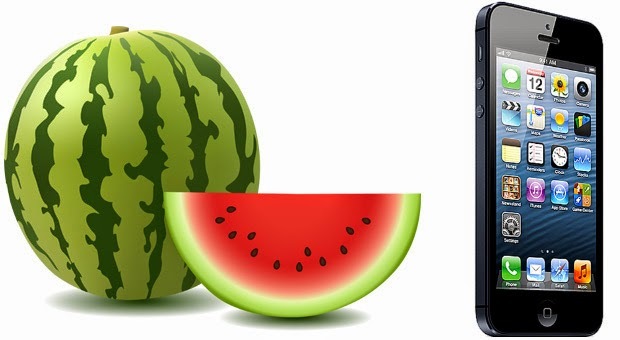 Home » »Unlabelled » Can an Actual Watermelon Charge an iPhone? 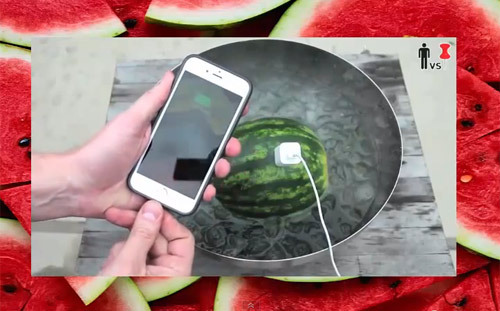 We all have seen our fair share of science projects involving potatoes, how electric currents can travel through them, and power low watt light bulbs; However, can an actual watermelon charge an iPhone? Researchers say yes! You can make a primitive battery virtually out of any wet fruit or vegetable by pushing a Zn (zinc) rod and Cu (copper) rod into the produce. The battery you are creating will be a very weak one and no more than about 1.1 volts, therefore it will only last a very limited amount of time. Note that when you create a watermelon battery with Zn or Cu rods, the watermelon is just supplying a slightly conductive liquid (electrolyte). The energy does not come from the watermelon itself, it comes from the reaction created within the cell caused by the two metal rods. Zn atoms are more reactive, so when the rods have the chance to corrode, the Zn rod wins by becoming Zn2+. Once it becomes Zn2+, it will then liberate two electrons that give your iPhone that weak charge. In other words, it is possible to charge your iPhone with a watermelon, but just one is not enough to give you the charge needed and are looking for! In order to give your iPhone the full charge, you would probably need the store’s whole shipment of watermelon, because of how weak a charge each one produces. The reason you would need so many watermelons to charge your phone is that you would need more than just a few to even reach a charge of just 1%. Now imagine trying to charge the phone completely! Why you may ask? The answer is simple theoretically speaking to make the charger work with just a melon, salt, and ice water you would need a very porous watermelon to absorb all the salt. It would need to grow next to a copper mine as well. Given that, most watermelons are organic and not grown next to copper mines, beta cellulose is what the outer green part is composed of along with fructose and water on the inside. There is not much for an ion electrical transfer in that mixture to create much power but it still is possible.